Characterized by its fast design and compact profile, the AF NIKKOR 50mm f/1.8D from Nikon is a versatile normal-length prime for everyday shooting. The bright f/1.4 maximum aperture benefits working in difficult lighting conditions and also helps achieve shallow depth of field and selective focus effects. A Super Integrated Coating has been applied to individual elements, and reduces lens flare and ghosting for increased contrast and color accuracy when working in bright and backlit conditions. Also, a rounded seven-blade diaphragm contributes to a pleasing bokeh quality. 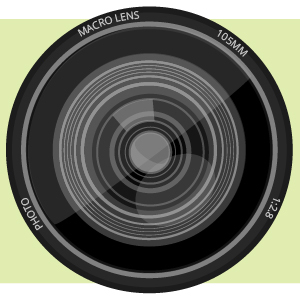 Normal-length prime lens is designed for FX-format Nikon F-mount cameras, however can also be used with DX models where it provides a 75mm equivalent focal length. Fast f/1.4 maximum aperture is well-suited to working in low-light environments and also affords extensive control over depth of field for using selective focus techniques. 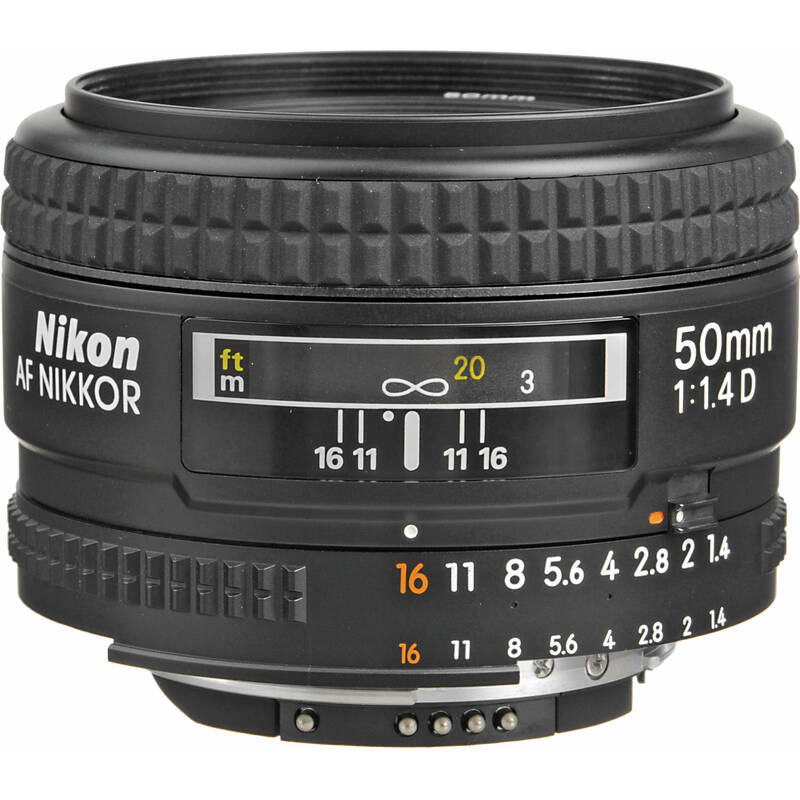 AF NIKKOR 50mm f/1.4D Lens is rated 4.7 out of 5 by 655. Rated 5 out of 5 by litebrite from results to cherish! ok, here's what you do.. instead of reading on the countless positive reviews and thinking about wether to buy this or the 1.8 version, save a little and buy this one instead! you will not be disappointed. i shoot with this lens at weddings, stage, and occations when there is a little room to walk around indoors without a flash, and you know what i get? AMAZING results! the sharpness, contrast, colors, bokeh, and the critical focus you get wide open that allows enough shutter, low ISO with handheld shots during low or availabe light is something that you will appreciate very much about the lens. use it with confidence! Rated 5 out of 5 by KR Productions from Amazing for video and photo! I am primarily a wedding videographer and have been using my D750 with the 24-120 F4 and 70-200 F2.8 mainly. (I also use a D7200 with the Tokina 11-16 and 17-55 F2.8 on a Glidecam) I have never owned a 50mm and finally decided to pull the trigger for something different this season... and wow! It sure is different! The bokeh off thing lens in fantastic! Also, the lens is very sharp and produces great colors. I have now been using this lens about 50% of the time on all my shoots so far in 2016. On the photography side, the results are the same. Beautiful bokeh and great colors. Wish I would have gotten this sooner. Rated 5 out of 5 by Boris from Exelent Lens Exelent image quality,sharp and fast. For years I used 5omm 1.8 D and decided to upgrade.What a difference, this lens bearly leaving my D700 now,and my 24-70 and 70-200 2.8 are covered with dust. I put them on my camera only when I shoot weddings because of their zoom capabilities. I have only one remark: This lens is very delicate, I hit it a bit in front when it was on my camera and lost autofocus.Sent it for repare and after $ works as a new. I heard the new version 50mm 1.4 G is much tougher and with the same image quality. Probably spending a bit more money will save you headackes later unless you are very careful with your equipment. Rated 5 out of 5 by pepper from Essential for low light and portraiture This is unequivocally one of my favorite lenses, and one that I use very often for general portraiture, small-venue concert photography, and any situation where available light is questionable. While not extremely sharp at f/1.4, I have used this lens to get sharp handheld pictures in rooms lit by a single low-wattage bulb hung from the ceiling. By the time you stop down to f/4 and smaller, the quality of the glass becomes very evident. The only con I can think of is that if you attach a lens filter and shoot with a bright light source in the frame, this lens seems more apt than some others to get flares or ghosts. Rated 4 out of 5 by jsnlee from The prime I reach for most... It's probably my shooting style, but this is the prime that I reach for most with my D90. I don't currently have a great wide lens, so that may factor into it too. This little lens does a great job with portraits and is perfect for just walking around the city. The optics are good and sometimes great. The lens is a bit dated in terms of features, but I haven't found it necessary to upgrade to the f/1.4G based on performance...maybe the next iteration. Overall, I really love the lens. I'd give it 4.5 stars if possible, but alas I'm stuck with either 4 or 5. If the optics were consistently great I'd give it the higher rating, but a solid 4 it is. Rated 5 out of 5 by Shabbir from A time tested great prime for my Nikons I purchased this lens from B&H twelve years ago and it is still one of my favorite primes. It is light weight, tough build and still in mint condition. It sustained a 10+ ft drop from a bridge during one of my trip to Yosemite national park. It takes amazing low light pictures with beautiful bokeh. It uses the cameras internal motor for auto-focus so it is louder than my newer Nikon lenses with Silent Wave motor. It will outlive your camera body few times for sure. I plan to use it for many more years to come. is it compatible with d5200? While you may mount the Nikon AF NIKKOR 50mm f/1.4D Autofocus Lens on the Nikon D5200 DSLR camera and you will have auto exposure capabilities, the lens will not autofocus on the camera, as it does not have its own built-in AF-S Silent Wave Motor for autofocus (and the Nikon D5200 DSLR camera does not have its own motor, so the motor must be in the lens). 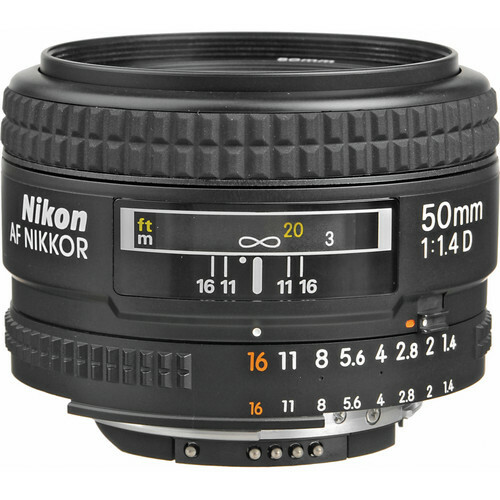 If you are looking for a 50mm f/1.4 lens that would autofocus on the Nikon D5200 DSLR camera, then I would instead recommend the Nikon AF-S NIKKOR 50mm f/1.4G Lens, B&amp;H # NI5014GAF, for your needs. is this lens good for weddings? This would be a great lens for weddings. The 50mm focal length would is very versatile and the fast f/1.4 aperture make this a choice for low light shooting. Will the auto-focus work with a D5500? The answer is correct. You need a body with a focus motor. See the Ken Rockwell web site for all the details. Does it work Nikon N70? Is this compatible with the D80? Is this lens made in Japan or China? Our current inventory is manufactured in Japan. hi. will this work for both F6 and D810? Asked by: Bong Hee K.
Yes, the Nikon AF NIKKOR 50mm f/1.4D Autofocus Lens, B&amp;H # NI5014DAF, would be compatible for use with both the Nikon F6 35mm film camera and the Nikon D810 DSLR camera. What is the difference between the USA lens and the imported lens? Both the USA and Imported/Grey Market items we carry would be made by the original manufacturer in the same factories using all the same components. The difference between the items would be how they are distributed to dealers/retailers for sale. USA items are distributed by Nikon USA directly to their authorized dealers, and as such, they would include a USA warranty and USA accessories (such as cables for USA outlets), etc. Items marked Imported are imported and/or distributed by other entities and sold through B&amp;H Photo-Video. As Nikon USA will not service, provide warranty repair, or even inspect an imported/grey market item, all Imported/Grey Market items we carry would instead come with a Limited 1-Year Warranty from B&amp;H Photo. In the case of warranty repair needs, you would send the item to B&amp;H Photo, and we would have the item repaired for you. Imported products do not qualify for manufacturers rebate programs. Shure! Your camera must have autofocus motor.It's the best cost benefit, i love it's lens.